Sometimes I have a reaction to eating vinegar. And sometimes I have a reaction to citrus. And sometimes I react to both! Salad dressings can be a challenge for me whenever this happens. Fortunately, for me, this doesn't happen as much as it used to, as I get older. Guess I should file that under "good things happen to old people." Anyway, I have two friends who have allergies to mold -- seriously negative reactions. And guess what? Mold is everywhere! What can be called a "mild intolerance" for me -- the vinegar reaction -- can be an allergic incident for either of them, if they ingest any mold or fermented foods, like vinegar. That means missing out on a lot of good stuff, but most notably, commercially made salad dressing and any other dressing-type condiment -- because they all contain the dreaded vinegar. Who knew? Well, besides me and my hyper-reactive tongue, who knew? I've known for a long time -- since I arrived on the planet, I'm guessing -- about my quirky tongue and its intolerance for vinegar, wine, mushrooms, potatoes and the real killers -- orange juice, eggplant, tomatoes, strawberries, nuts and pineapple. And any two of these eaten at the same meal -- well, it's just a mouth full of hell! I love tomatoes, but I will almost never eat tomatoes in a salad with vinegar-based dressing. And I won't eat most salads with fruit in them either. And I love eggplant Parmesan -- but tomato sauce and eggplant together? No way I'm going for that! There is a long list of offending foods, but you get the idea. And I see you scratching your head, wondering why I'm still alive. Remember, I said "intolerance." I don't get sick, I just have a tongue full of painful red welts than feel like raging fire in my mouth. Let's just say, I have developed a somewhat elevated tolerance for pain in the interest of tasting all kinds of things that hurt/taste so good! I can just imagine the torture if I had severe reactions to mold and it's fermented food spin-offs. But here's the strange thing, for me anyway. 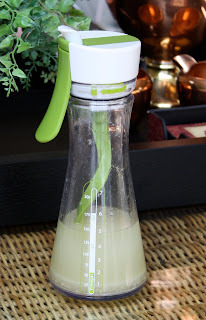 When I started making my own salad dressing with lemon juice instead of vinegar, my tongue almost never reacted to it, even though citrus usually sends me into immediate "intolerance" mode. Maybe it has something to do with coating the citrus molecules in good old olive oil. What-ever! I never had chemistry. Does it show? And we're back to another citrus salad dressing plus. I don't have to worry so much about mixing two reactive foods at the same meal. Life got better, because salads are on my Top Five Favorite Foods list. Making salad dressing this way is easy and fast. But best of all, it gives you more control over the foods you eat -- and don't eat! -- and exposes you to fewer processed foods and the chemicals that preserve them. Gotta love that! Both of my mold-allergy, avoid vinegar at all costs friends appreciated the salad dressings I made with lemon juice at a recent party. So did my tongue and I! The front row of my olive oil collection. While the clove of garlic is still inside skin, place it on a flat surface and lay the flat side of a knife or food scraper over it. Carefully give it a smack with the palm of your had to smash the garlic. Now the skin should peel easily from the clove of garlic. Place the clove of garlic in a wooden salad bowl. Using a fork, smash the garlic with the salt against the inside of the bowl until it becomes a grainy paste. Add olive oil to the garlic paste in the bowl. ** Squeeze in juice of ½ large lemon. Remove any seeds that fall into the bowl. Using a wire whisk, blend the olive oil and lemon juice thoroughly. Add a teaspoon, or so, of Herbes de Provence to the dressing. Let sit at room temperature for at least an hour before serving. Whisk again before adding to salads or using as a marinade for meat, chicken or vegetables. Mix, serve and store in one container! * Substitute Meyer lemons, limes, Key limes, oranges, Blood oranges, tangerines, grapefruit etc. ** Sometimes I make this in a mini food processor, after I’ve mashed the garlic and salt mixture. Other times I use this handy salad dressing mixer/dispenser. The center blade rotates to emulsify the dressing when the handle is squeezed and then dressing can be poured from the spout. Really good for those who prefer to add dressing to salads themselves! *** You may substitute other herbs or spices to alter the flavor to suit your salad. Cumin is good for taco salad. Cinnamon is good for salads with sliced apple or pears and blue or goat cheese. Greek herb blends are good for Greek salads. Basil and oregano are good for sliced fresh tomatoes and fresh goat cheese. Just start with a small amount of herbs and taste before you add more – until you reach the intensity of herb flavor you want. Remember the flavor with become a bit stronger as it sits at room temperature before serving. Love it, love it, love, love, love it!